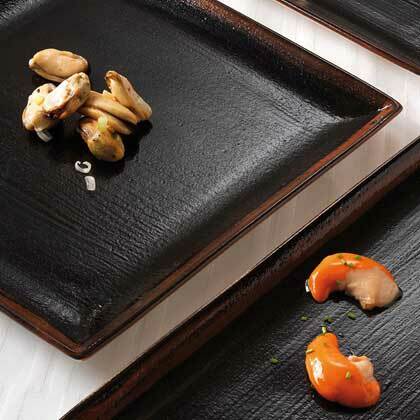 Steelite Distinction Koto is a dark, dramatic delectation. The inspiration was drawn from ancient Japanese Tenmoku Glazes. These beautiful glazes vary subtly in texture and tone from piece to piece embodying the craft of the traditional potter. The pieces are hand finished with a rich iron red glaze, which interacts in the kiln to produce a warm, organic, lustrous effect. Koto is the perfect canvas on which to present the art of Eastern cuisine. The deep black textured surface allows food to be perfectly framed, adding drama and contrast to presentation. Lifetime Edge-Chip Warranty!